Bo sent a quick group text to the Counsel Council to take a should-I-go-on-a-date-with-my-wife poll. They all agreed, with varying levels of enthusiasm, that he should go on the date. He decided not to tell his children he was meeting their mother until after. 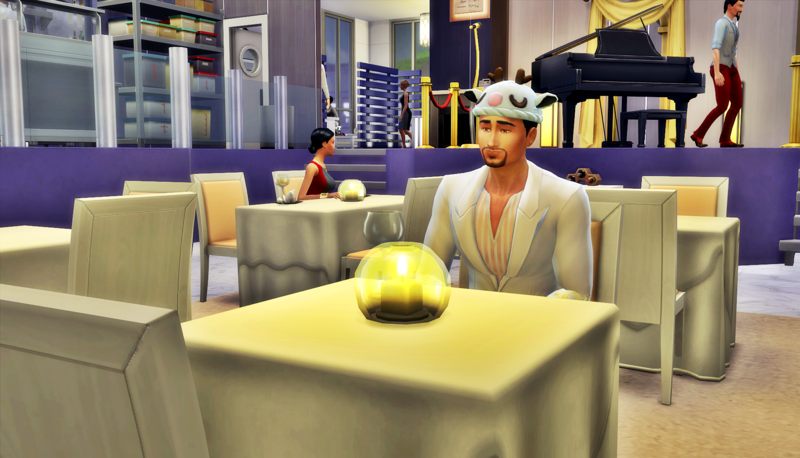 He dressed in his formal wear, with his favorite hat, and headed over to the Chez Llama. It was right next door to where Heaven now lived. Bo checked in with the maître d’. Soon, he and Heaven were seated at a nice table in the dining room. 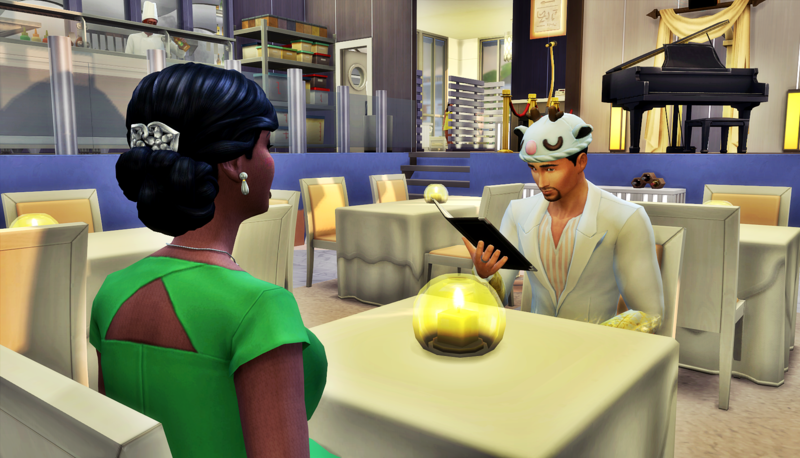 Bo wasn’t sure what to say, so he perused the menu, trying not to get distracted by Heaven’s eyes boring a hole through him. 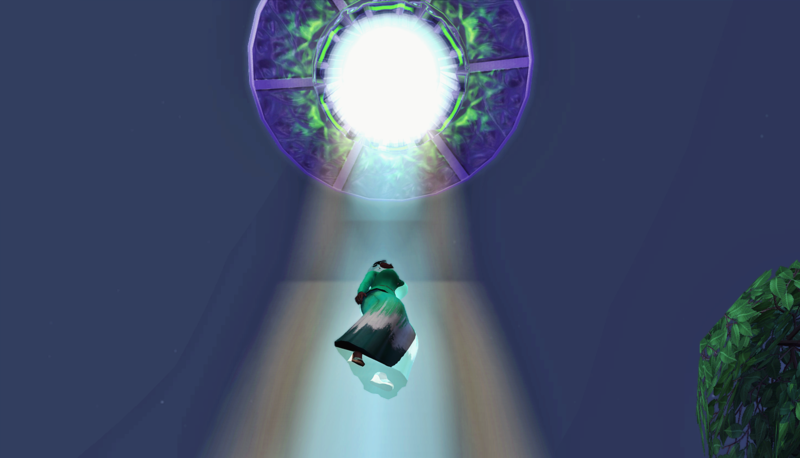 After he decided on his meal options, Bo had no choice but to turn his attention to Heaven. She was even more beautiful than he remembered. 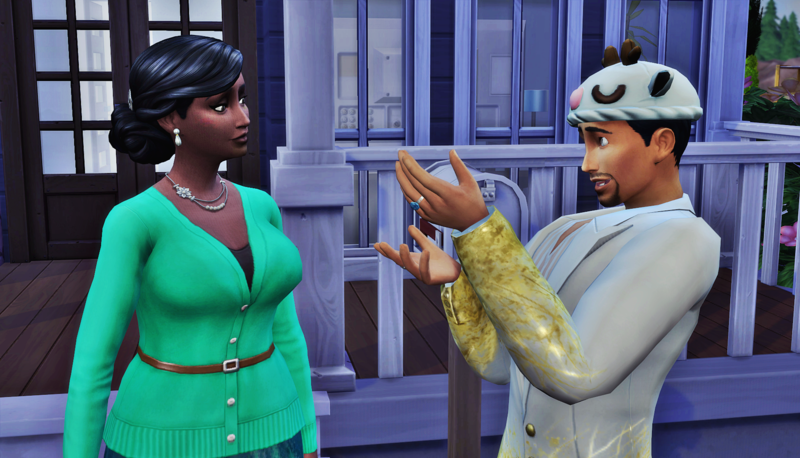 He had long ago gotten used to her Sim disguise, and when he looked at her, he could see her Sixam appearance underneath. Now he was the one who couldn’t tear his eyes away. 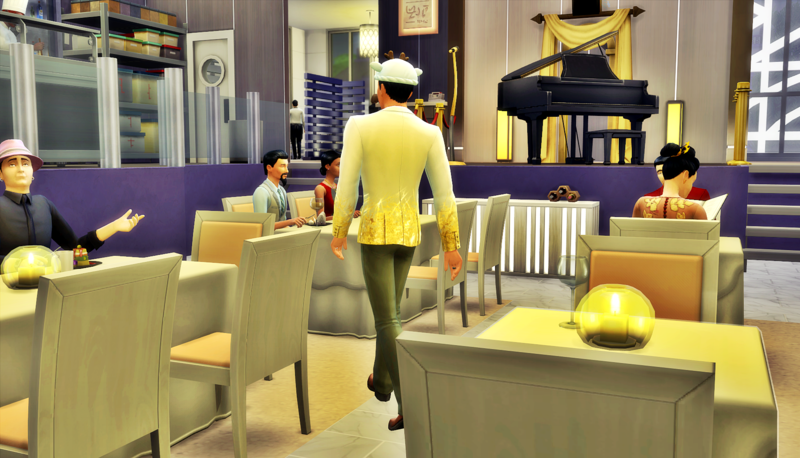 Their waiter came to take their order, and if Bo’s life depended on it, he wouldn’t be able to describe one thing about how that man looked. 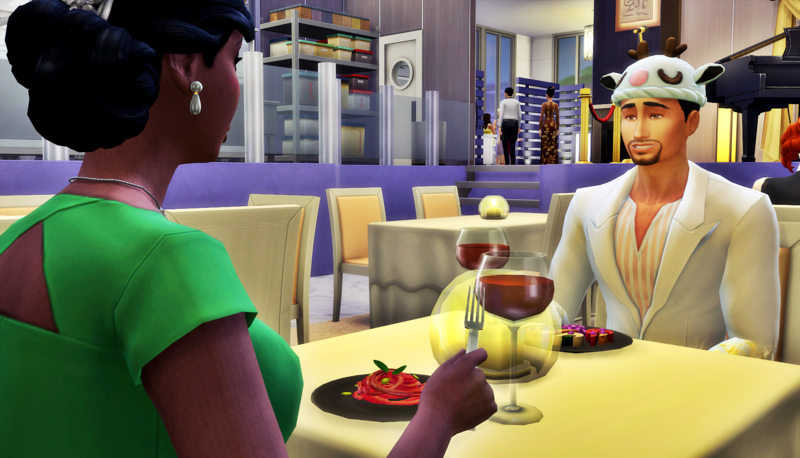 While they waited for their food, they made small talk. “Can you believe this is what they think is Sixamian food? I do not see a single menu item with quill fruit,” said Bo. “I know! It is quite amusing. 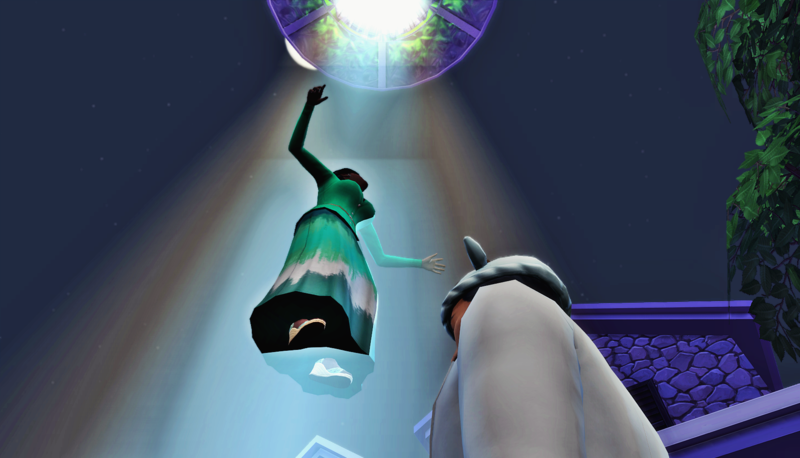 These Sims are so fascinated with us, yet they get it so wrong,” replied Heaven. 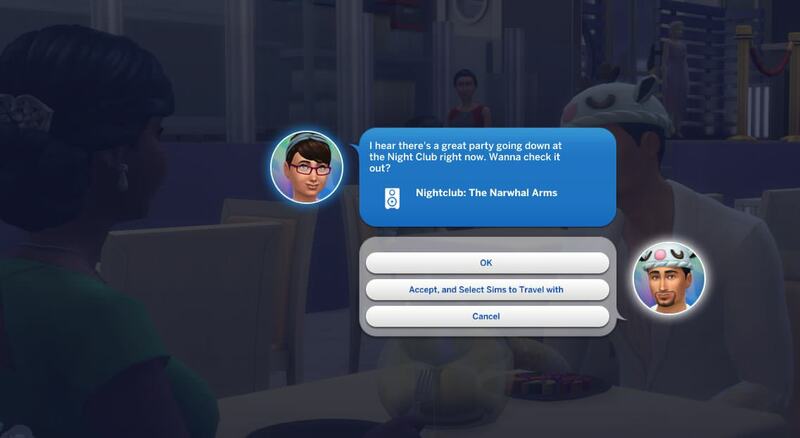 They both seemed very interested in having a good time, and not having any fights. Their conversation was easier than it had been since before Gem and Asa aged up to teenagers. Heaven shared her difficulties with breaking into the music business. She was competing with much younger Young Adults like Sofia Bjergsen, who had been playing as a musician and building a reputation since she was a teenager. Bo shared how pleasantly surprised he was to find he enjoyed working, particularly because he got play video games all day. Things were going well, so Bo was happy to decline when Laurel sent the rescue text they agreed on before his date. “Bo, I believe I am blushing,” said Heaven. Heaven, feeling shy, and always worried about exposure, couldn’t contain the way Bo was making her feel. She sat there, glowing bright pink, and let him admire her for a few moments before excusing herself to the restroom. While Heaven was in the restroom, Bo sat patiently. Part of him wanted to smile and revel in the fact that his wife wanted him. And judging by her glow she really wanted him. But something was off. She spoke about working to become a famous musician, but she never asked about their offspring. He considered whether he would ask her to move home, but nothing about their conversation made it seem possible. When he realized Heaven had been gone for a while, he went to go look for her. 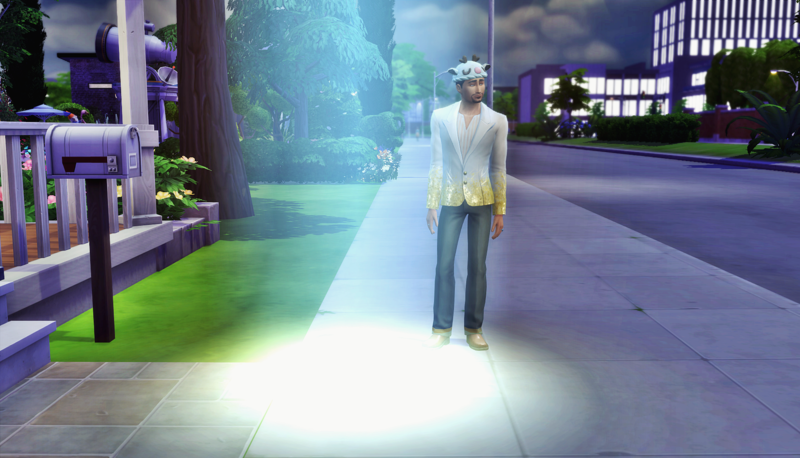 Bo hoped Heaven had not abandoned him. As much as he wanted to believe they could reconnect as a couple and come to rely on each other again, that was not their reality yet. He was very relieved when he realized where Heaven went. Bo: Well, that was unexpected. I wonder how they knew to look for us so far from the place they think we share as a home. 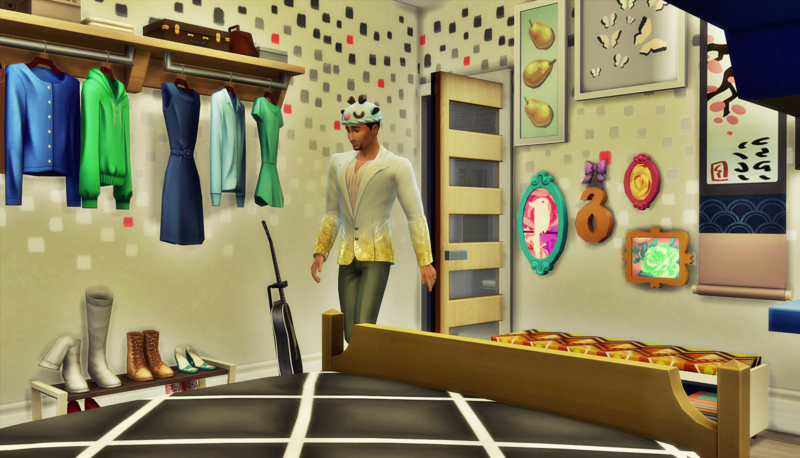 Bo headed into Heaven’s house and down to her room. He could have headed home, but he wanted to hear what happened when she finally returned. He was very sleepy, and she was gone for a long time. Eventually, Bo fell asleep, taking a nap until his Sixam ears heard the familiar sound of an approaching space ship. “I will do that,” said Bo. He gave Heaven a warm hug before departing. I really need to get back into the pen pal project. I have all of these thoughts of her motivations behind her behavior. 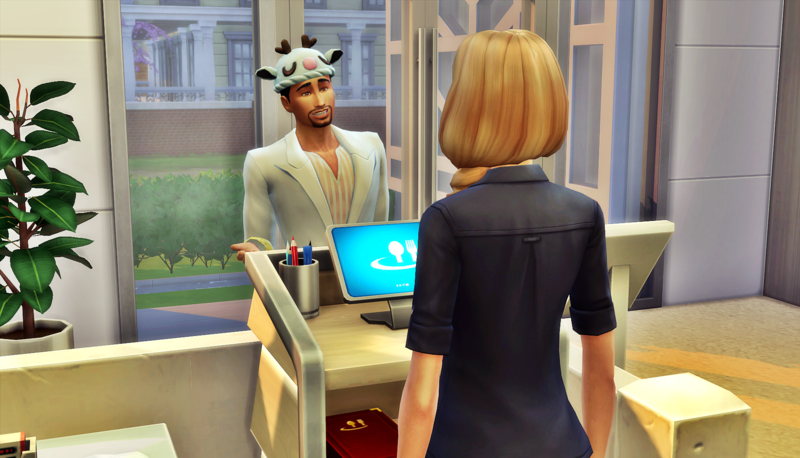 But in trying to reduce how many Sims my story focuses on, I didn’t really want to dig too much into it. I’mma give her a chapter in the next round though, because I know people are wondering what is up with her. And this! “when it is late at night, I remember it too well.” LOL poor guy! 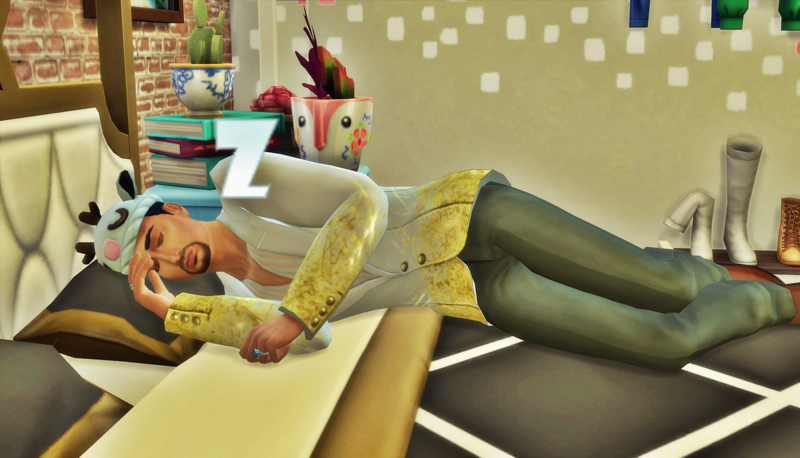 Yeah… He’s feeling the pain of not having woohoo for a while. Ugh, I’m not buying this crap from Heaven though. This woman needs to make up her mind and not string poor Bo along 😦 I feel so mean. I’m sorry 😂 I just think Heaven will bring Bo and the kids nothing but heartache at this point. Time to move on! 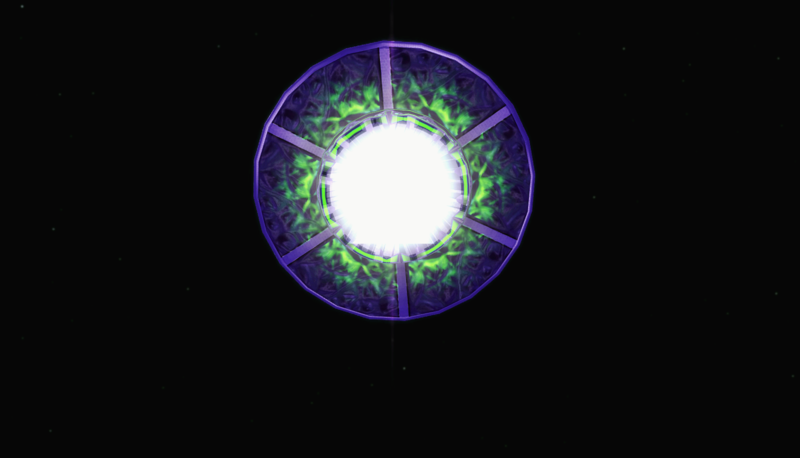 If I had settings or a mod to trigger an abduction, I could not have planned it more perfectly. Bo was about to go in for the kill, a little woohoo action. I had the Tab photo function going, ready to get a good shot of their moment, then Heaven started levitating! 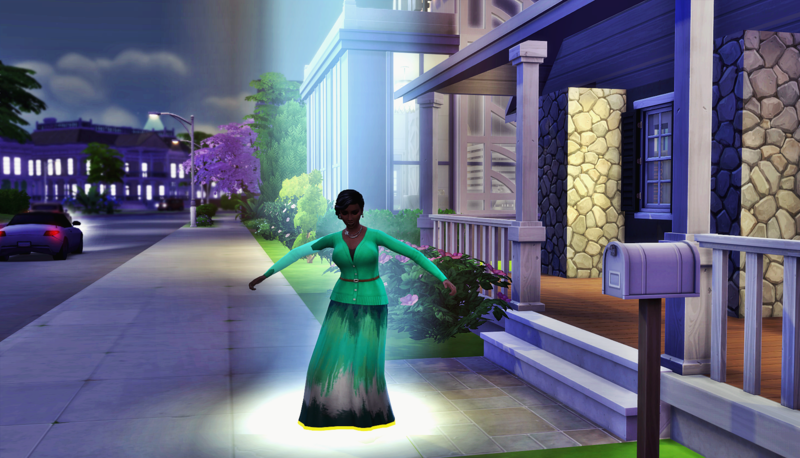 That was an amazing Sim moment. Glad to know we’ve got another vote against them reuniting. So, I guess you’re not #TeamHeaven, huh? Lol, yeah… she’s just not into being a mother. These Sims came out of CAS as a married couple with two Child age kids (not twins). But she never rolled a whim to have babies with Bo, hardly ever whimmed to hang with her family. So far it seems Heaven was just meant for other things. I keep hoping she’ll surprise me though. Sorry….not so much and I really want Bo to move on. The kids have. But we will see. Ahhh, I want to give a spoiler so bad right now! But I won’t. Just give it a couple days. OMG ! So surprising ! So funny ! 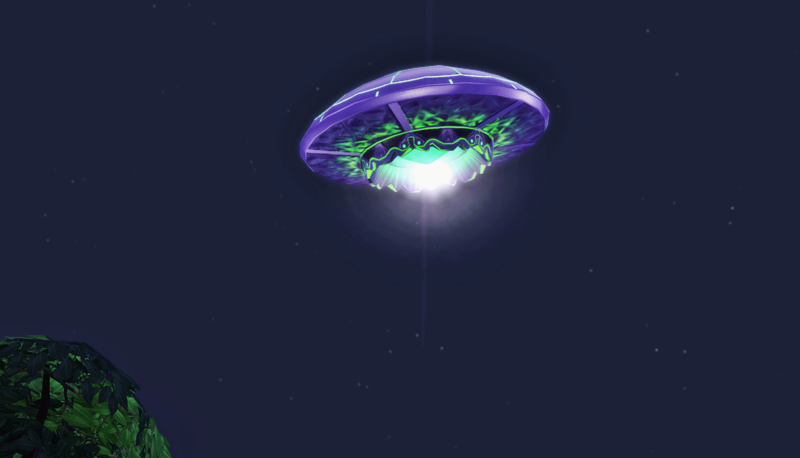 The alien abduction was a surprise to me too! I’m glad you enjoyed the chapter. 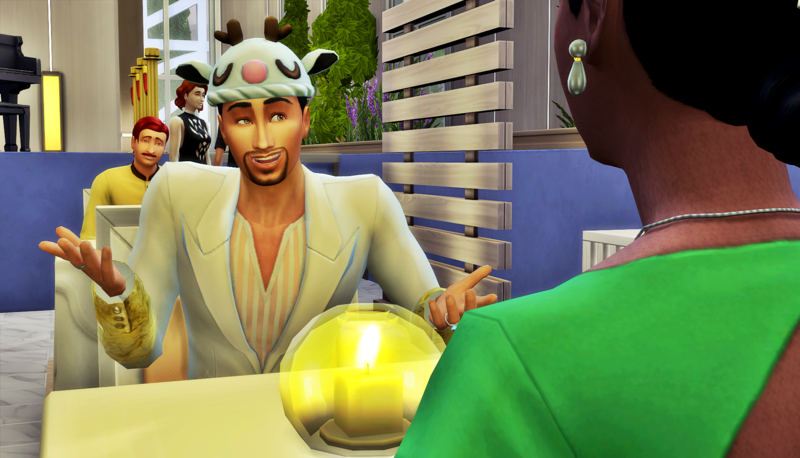 And no matter how many makeovers I give Bo, he’s never losing that hat, lol.